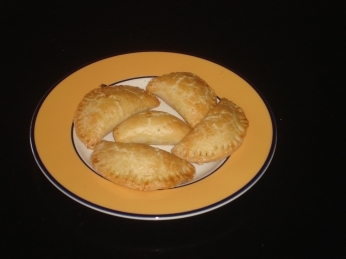 There are a variety of cheese pies made in Greece. This is one made with Greek strained yoghurt. Please note, the yoghurt is not part of the filling, but is part of the dough itself, which gives it its own special taste. These small pies can be served as a side dish, or as a meze or in a buffet. They may be quite small, but they are actually rather filling and, of course, very tasty! They are also very easy to make. Mix the flour with the salt and rub in the butter. Beat 2 of the eggs with the yoghurt and add to the flour mixture. Mix all the ingredients but don’t knead the dough a lot. Make the dough into a ball, cover with cling film and put it in the fridge. On a floured surface, roll out the dough to a thickness of about ½ cm. Cut the dough into circles of about 7 ½ cm diameter with the help of a cup or a circular cutter. Remove the uncut dough, roll it into a ball and put back in the fridge. Brush the circles with water and add 1 teaspoon of the crumbled Feta along the central diameter of each. Fold the circles into semi-circles with the cheese inside and press the joined edge with a fork. Beat the remaining egg and brush the cheese pies with it. Place the pies in a large, shallow, buttered oven dish. Bake them in a pre-heated oven at 180 degrees for about 30 minutes or until they have turned golden brown. They remind me of the pastys we get in the UK which are delicious - I coudl eat one right now!! These sound wonderful. I am going to try them. Since I just found your site, I am going to look around and hopefully find some other tasty treats! This looks like a really easy to do vegetarian recipe. Thanks! Great recipe. Very simple, yet I think my family will enjoy this. Thanks! These were so nice I made them again the next day. This time I mixed a beaten egg and some black pepper with the feta which made the pies a little more moist inside as without it they can be a bit dry. Gets a bit messier in the folding stage but well worth it. This pastry is excellent - works every time! Used it for spanakopita; Greek cheese and spinach pie, either as individual pies or made in a large pan as one big pie. Aaaa turopitakia!Polu nostima, mou exoun leipsei! Very easy to make and absolutely delicious tiropitakia! Perfect pastry and tasty filling (I also added a little parmesan). I will be making these again for certain. :o) Efharisto poli! So glad you enjoyed them! They are delicious, aren't they? !